Is the earth very finely-tuned for life? Does this indicate that God designed it? Or is there life on millions of planets in our Galaxy or the universe as a whole? Plenty of scientists have thought about these questions, but there is no consensus yet. There seems to be little doubt that there are literally billions of planets out there which appear to be possible candidates for life. And many scientists think that it is likely that many of them might support microbial life. But there is little agreement on whether intelligent life is common or rare elsewhere in the universe. Some ask, if there is life out there, why haven’t we been able to detect it after decades of trying, but it seems that any life elsewhere might be too far away or not contemporary with us. Is Earth specially suited to life? Our solar system is in the right position in the best type of galaxy (spiral). Elliptical galaxies and the centre of spiral galaxies are too unstable for the long process of evolution of life. Elliptical galaxies and the edge of spiral galaxies have far less of the heavier elements which are necessary to form planets like earth, and for life to form. Our sun, a yellow dwarf, is just the right size and type, and very stable. The more numerous red dwarfs are much less likely to allow life on any orbiting planets, and larger stars are too short-lived for earthlike planets and life to evolve. The structure of our solar system is optimal for life. 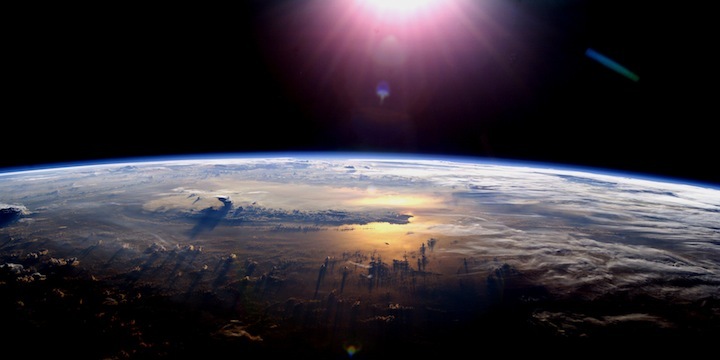 The earth is within the “circumstellar habitable zone” that allows liquid water to form on the earth’s surface – 5% closer or further away from the sun and we wouldn’t have surface water, nor the optimum amount of carbon and oxygen. The earth’s orbit is nearly circular, which provides a stable temperature. The larger outer planets’ orbits are also nearly circular, which reduces the gravitational pull on earth and the potential to destabilise earth’s orbit. The larger outer planets act as a comet and asteroid shield protecting earth from fatal collisions. The moon is unusually large, which creates larger tides necessary for oceanic processes, but not too large. Finally, many features of the earth are serendipitous, including plate tectonics, which are seen by some scientists to being crucial for a whole range of important earth processes, the earth’s albedo which ensures that just the right amount of sunlight is reflected, and the ‘just right’ mass of the earth to retain our beneficial atmosphere and retain heat stored in the earth’s core. Some scientists say there are more than 200 known parameters necessary for a planet to support life. Is the earth rare then? There is no doubt that the earth is in the right place and has the right characteristics to allow life – after all, we wouldn’t be here if it wasn’t! However it is uncertain if this is surprising – after all there are zillions of stars (perhaps 1022) and probably billions of planets (we don’t really know how many). While many agree on the possibility of microbial life elsewhere in the universe, and even in our solar system, there is no scientific agreement on whether there is other intelligent life. So we need to assess how likely it is that some of these planets support life. Scientists estimate that 100 million planets in our galaxy alone could have the potential to support life. It therefore seems likely, it is argued, that intelligent life would evolve in at least some of them. The Drake Equation attempts to estimate the likely number of civilisations in our galaxy, based on factors like the number of stars with planets, the percentage of planets that could support life, and the length of time a civilisation would last. According to Wikipedia, the Drake Equation can give answers in the range from just two to 280 million. Such a large range suggests the equation is not very useful. But if the best answer is somewhere within this range, and if our galaxy is representative of the approximately 1011 other galaxies, life is not so rare in the universe and the earth is not particularly fine-tuned. Many scientists draw this conclusion – e.g. NASA (which expects to find life elsewhere within 20 years), Carl Sagan, and those in the SETI (Search for Extra Terrestrial Intelligence) movement. Some estimate that as many as 1020 planets in the known universe may be habitable. However the Drake equation does not consider many of the 200 factors now identified which are critical for life and must be considered, and the extrapolation to other galaxies takes no account of the apparent greater suitability of our galaxy. Therefore many question its usefulness. Spiegel and Turner have undertaken mathematical analysis that shows that some of the values assumed in the Drake Equation are problematic, and while not ruling out the results, suggest that some of the Drake Equation estimates are somewhat optimistic. Nevertheless, even if the Drake Equation is not very useful, many scientists believe that there are no obvious reasons why conditions on earth couldn’t be repeated elsewhere. On the other hand, Ward and Brownlee, investigating the same questions, developed the Rare Earth Equation, and came to the conclusion that the earth is indeed a rare place and that life is “exceedingly rare in our galaxy and in the universe”. In an interview, Ward indicates he thinks microbial life might be common in the universe, but continues to believe complex life is rare. Others have followed their lead. Barrow & Tipler concluded that we are the only life in our galaxy and possibly in the universe. Ross has listed more than 150 factors supporting a rare earth conclusion, and others have used his information to make probability estimates leading to the conclusion that life on earth may be unique. Brian Cox also argues against the likelihood of intelligent life elsewhere in the universe. He believes that the biological processes which led to the human race on earth were a fluke, and had to overcome a number of “evolutionary bottlenecks” which make it highly unlikely that intelligent life has formed anywhere else. Some scientists (including noted physicist Enrico Fermi) have argued that, if there were other civilisations ‘out there’, some of them would have developed faster than we have, and would have colonised earth by now, or at least contacted us. But this hasn’t happened, and after decades of searching for signs of extra terestrial intelligence (e.g. by monitoring electromagnetic signals from space), no signs of any life have been found. So, it is argued, there is probably no-one out there. However calculations done by Forgan and Rice show that if there are other civilisations, they are likely to be either too far away to contact us, or not contemporary with ours because (they suggest) advanced civilisations probably don’t last very long. Other reasons have been raised suggesting that civilisation may be there but we are not aware of them. Some conspiracy theorists, some of them apparently credible observers, argue that we have been visited by aliens or UFOs but governments have hushed this up. Bayesian analysis was used to update this probability in the light of the fact that, as per the Fermi paradox, no signs of other intelligent life have been found. The probability that we are alone in our galaxy is estimated to be between 53% and 99.6% – i.e. very likely. The probability that we are alone in the observable universe is estimated to be between 39% and 85% – i.e. quite likely. There is one way in which the earth is definitely unique. A recent paper examined the occurrence of the rare element beryllium on earth. Beryllium is currently known to be an essential component in 122 different minerals, and statistical analysis indicates it probably occurs in 91 other minerals that haven’t yet been discovered. From this information, the probabilities of the same beryllium minerals occurring on another earth-like planet is found to be very small (about 1 in 10 billion). Extrapolating to other minerals leads to the conclusion that the chances of another planet in the universe duplicating earth’s mineralogy is less than 1 in 10^322. Using an estimate of 10^22 for the number of candidate planets in the universe, the authors conclude: Earth’s mineralogy is unique in the cosmos. So the earth does appear to be unique in its mineralogy, but of course this says little about whether life is unique, because it is doubtful if many of these possible mineralogies would prevent life if other factors were conducive to life. So, is the earth rare? Until recently, it was impossible to know. There was wide variation in the opinions of those making an assessment. But it now seems that it is much less likely that there is other life in the universe than was once thought. And if there is life out there somewhere, it is very likely to be too far away to ever make contact. Does a rare earth point to God? I suppose if human life is unique in the universe and a life-supporting planet like earth is very rare, we may feel this reinforces belief in God. But some sceptics take the view that a universe where life is absent almost everywhere shows that it isn’t very well designed. Neither of these arguments seem very strong to me. I suppose the unlikelihood of other life may slightly increase the possibility that God created life, but I wouldn’t think I’d ever want to make such an argument. DNA, genes and human history – do our discoveries about DNA make it harder or easier to believe in God? Evolution and its critics – is the evidence against evolution as some critics claim?